Summer DX is always better than Winter. Collection of Interesting Places Worked Recently. 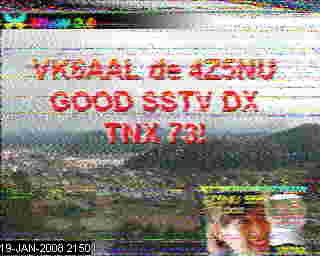 DX Monitor Software with HamCap propagation forcasting feature on new release see link on VK6AAL Home Page to Download. 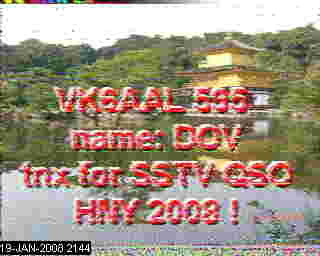 A good place to listen at night is the Southern Cross DX Net on 14.238.5 W1FDY net control can be heard here in VK6 at 10:00 PM local time a good indicator of possible SSTV opportunities on 230 US short path. 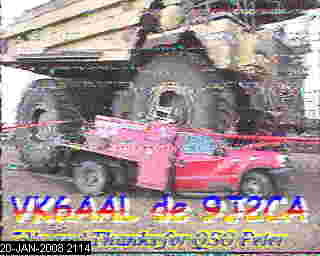 If you are interesting in what is happening on the DX front from South Africa then go to the South African Radio League and register for the HF Happenings Newsletter this is great source of DX news from down under http://www.sarl.org.za/hf_happenings.asp this is sent out by email. No Long path to EU openings heard for months. Long path US openings rare this summmer when it does open its good but not often. Short path EU has been open most evenings between 10pm to 1am WST. Short Path US activity has been variable during mornings 8am to 9am WSTonly a few stations worked. Summer propagation is producing improved results on SP to Africa and Middle East and EU with good signals into England most evenings. Several new rare contacts for this month. 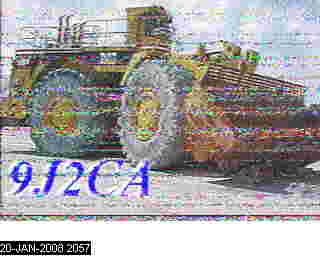 Long path US openings started again this week with AD1Y and W6LYS then 5/12/07 worked W5ZNN with a 595 signal strongest LP US signal seen to date. Short path EU has been open most evenings between 7pm to 11pm WST. Short Path US activity has been variable with only a few stations heard in mornings 5/12/07 worked W&GET with 50w. Summer propagation is producing improved results on SP to EU with good signals into England most evenings. 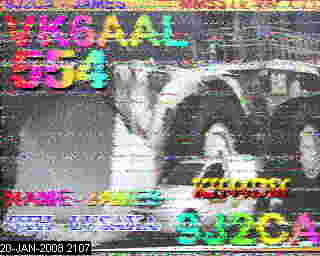 SU1KM the only rare contact for the last few months. Unusual openings seen with signals form US at 9pm WST on heading of 330 Degrees North West. Long path to EU openings heard last week. Long path US openings heard last week. Short path EU has been open most evenings between 7pm to 9pm WST. Short Path US activity has dropped off with only a few stations heard propagation still there in mornings but no activity. Propagation is moving towards Summer and produced improved results on SP to EU. Long path to EU nothing heard. Long path US nothing heard. Short path EU has been mainly from Russia most evenings with a mix of Mid Day early afternoon activity to Middle East region. 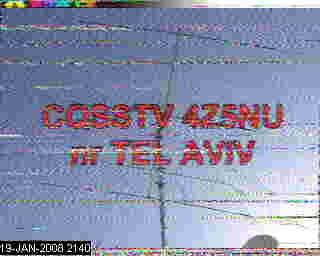 Short Path US has been consitantly open during day from midday to early afternoon with VE stations heard on ocassions. Winter propagation has slowed activity on LP and produced improved results on SP to US. Long path to EU sporadic openings with only a few stations mid afternoon openings more common than late afternoon this month. Long path US nothing heard this month the LP path is virtually closed at this part of the season. Short path EU has been mainly from Russia most evenings with a mix of early evening JA activity late evening EU has produced only 2 openings. Short Path US has been consitantly open during day from midday to late afternoon with VE stations heard on ocassions. Winter propagation has slowed activity on LP and produced improved results on SP. Long path to EU not monitored this week. Short path EU has been mainly from Russia late evening. Short Path US has been the hot path week during day at early afternoon. Last few days have had High levels of Solar Activity creates unusually noisy conditions. 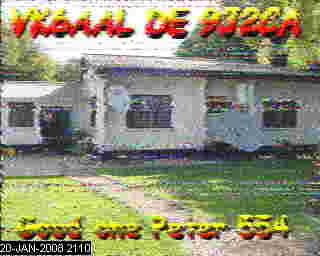 15m ZL opened with some good pictures on Sunday 29/4 this is first time we have heard ZL on 21.340 so 15m is picking up. Long path to EU several good pictures from Victor EA5FO and a few Italians where is everyone else in EU. Long path US has been poor only a few pictures recieved this week. 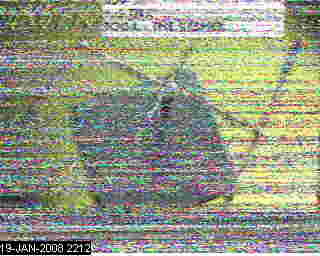 Short path EU cam alive on 19th late in the evening with a short opening and one station worked good signals aside from QRM. 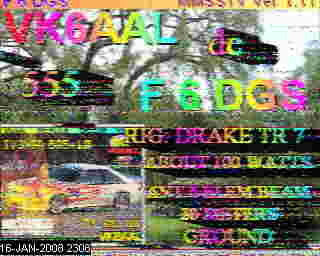 Short Path US nothing heard even the net freq has been quiet. 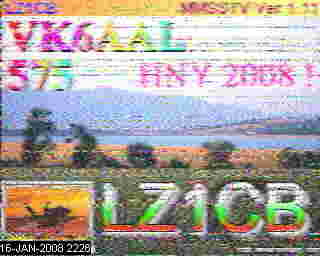 The unsual propagation has been ZL pictures turning up on US webcams late in the afternoon when working EU LP this was becoming quite regular so I monitored it for a few days and sure enouigh my pictures were there with only 30w, no one up in US at that time of night. Long path to EU has been fairly quiet apart from several good pictures from Victor EA5FO. Long path US has been very poor with most pictures in the noise most have been Q3 and no Q5 pictures recieved this week. Short path EU has been non existant in VK6 again all week. 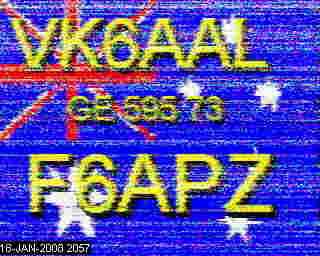 Short Path US had a good opening last night with AD1Y Tony putting a solid 5/7/4 local QRN prevented a Q5 picture but good signals both ways. 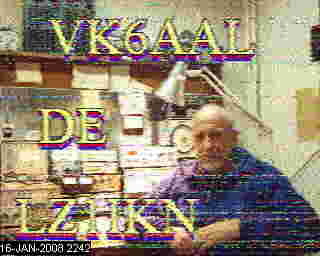 Bob VK6POP and VK6AAL tested 7.033 one night this week the static crashes are dropping off as the Winter Cycle approaches and BOB worked several JA stations on his 80m loop, we will be spending some more time on 7.033 this winter in the evening looking for JA and EU DX. Short Path to Europe has been Russia only , a few US sightings on Short Path. The Long Path to the US very low a few noisy pictures. The Long Path to the EU more specifically EA5FO has been very strong this week with openings of 595 worked on 30W RMS. The East coast where seen working JA on 15m this week and a few strong stations. Later part of this week has been very poor and a large Geomagnetic Disturbance was reported on Space Weather Alerts from April 1 to April 4 ongoing. Short Path to Europe has been open this week mainly Russia, the US remains virtually non existant on Short Path. The Long Path to the US opened on Monday morning with the contest still in full swing despite the QRM this opening lasted for 30m minutes with signals up to 575 one of the best openings for weeks. 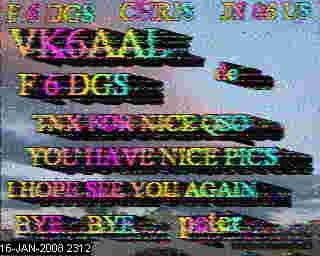 New Zealand opened late in the afternoon on Saturday and it was a reminder of the Good Old Days when 595 solid signals where both ways for an hour and inspite of Contest QRM great pictures were exchanged. 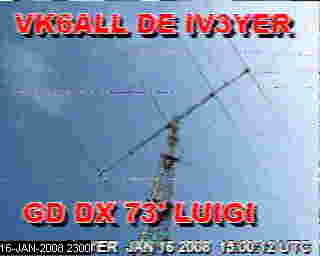 15m from JA had a solid opening into VK6 and VK3 on Monday and several good contacts where made on the 40m Dipole with 100w and Paul VK3HJV was working at the same time from VK3 with his triband beam this was an unusual opening with VK6AAL turning up as strong in VK3 as in JA we have not seen this on 15m openings last year. This week I spent more time checking propagation at times when these windows occurr on long path and the footprint of the window is very narow some times as small as 5-10 mins of overlap between VK6 and the path destinations, by comparing with VK4 figures and path optimums it is clear that these windows probably only extend as far as VK5 at these times. The explains further why some times VK4 and VK6 are hearing completely different DX paths at the same time. 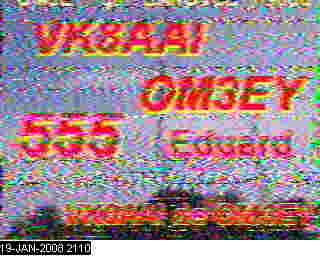 Thursday night VK4MOD was busy working European stations and pictures from his cam where showing good copies both ways and VK6POP and VK6ALL where not recieveing 1 single picture or signal on the whole of 20m, I monitored this for 3 hours and nothing was heard in VK6. Another example of these very narrow path openings. With the low end of the Solar Cycle the DX windows are both very narrow in foot print and and time the same path and time slot in VK4 has the EU LP footprint at the peak in the middle of the Atlantic Ocean where VK6 is covering the West Coast of Spain.